In the fall of 2011 I first created a presentation on this topic for the NASA Project Management Challenge 2012 to which I was invited as a speaker following my first stint in 2011. 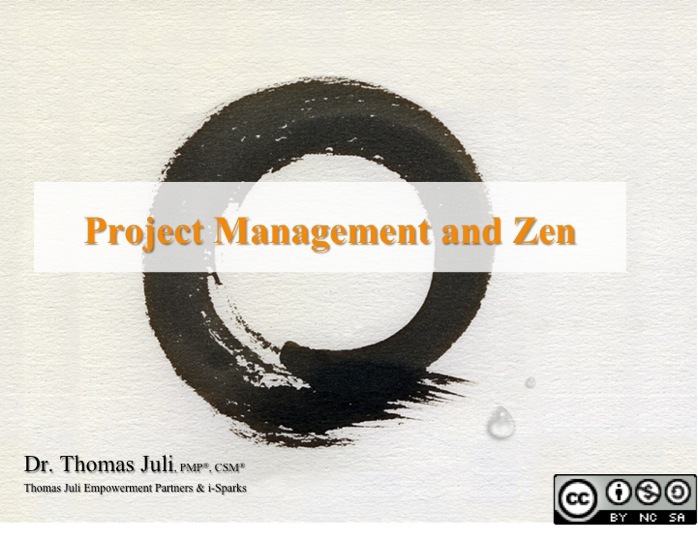 The presentation “Project Management and Zen” is now available on Slideshare and is free for downloading, sharing, remixing, you name it, as I am publishing it under the Creative Commons agreement. Please share your stories and experiences about Zen in the world of project management. If you happen to give this presentation anywhere in the world, please let us know. November 1, 2012: I will present a modified / updated version of “Project Management and Zen” at the Synergy Project Management Event on November 1, 2012 at the IndigO2 in London, UK. My focus will be on how to achieve a “work-life balance“. Thank you, Frank, for sharing the valuable insights of Project Management and Zen set forth in my presentation and making it available to a larger audience.